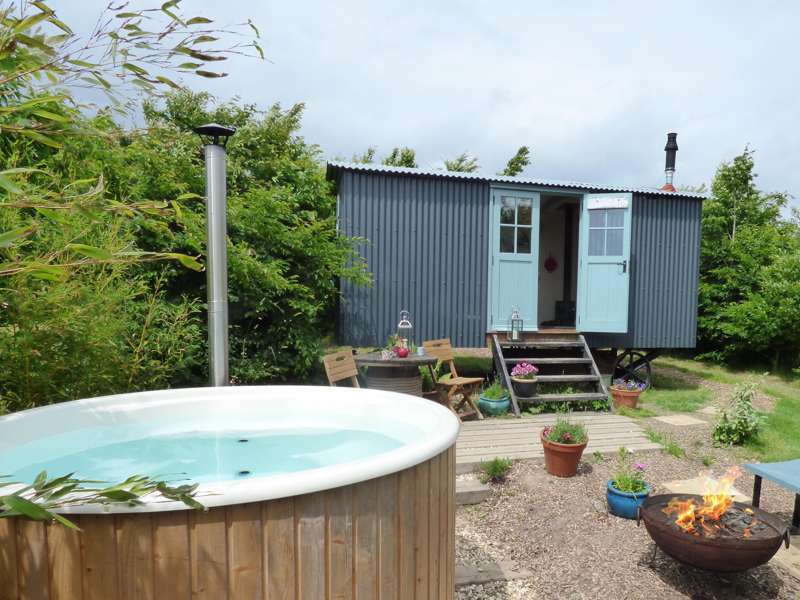 Nestled at the bottom of a hill and hidden away in an orchard you'll find the Stocklinch Shepherd's Hut with stunning panoramic views and sunsets where you can enjoy a restful and relaxing break, you also have your very own private wood-fired hot tub! Nestled at the bottom of a hill is Stocklinch, a peaceful Somerset village surrounded by farmland in the perfect position for exploring the gentle unspoilt south somerset countryside or for heading further afield to Lyme Regis & the Jurassic Coast for some sea air or heading inland to the Quantock & Exmoor Hills to experience Somerset's more rugged, wild side. From the steps of the hut you can enjoy many gentle walks and cycles exploring the hidden sunken lanes and expansive views across Somerset. And in the immediate area there are many heritage properties and gardens including NT Barrington Court which is only a short walk over the hill. In this corner of Somerset there are numerous pretty Market Towns and welcoming pubs to explore and discover. One of the very first things we did when we moved into The Old Post Office was to plant hundreds of trees in our field so you'll find the hut in a very private spot tucked away in about a third of an acre of orchard, surrounded by willows and other native trees & hedging. However we were careful not to plant anything that would get in the way of the wonderful uninterrupted views across the fields looking towards the Blackdown, Brendon and Quantock Hills with distant glimpses of Exmoor. We regularly get excellent clear skies making this the perfect spot to take in the stars. And this being Owl Street, listen out for the hoots and also look out for the bats, badgers, hedgehogs, buzzards and birds who are all frequent visitors! 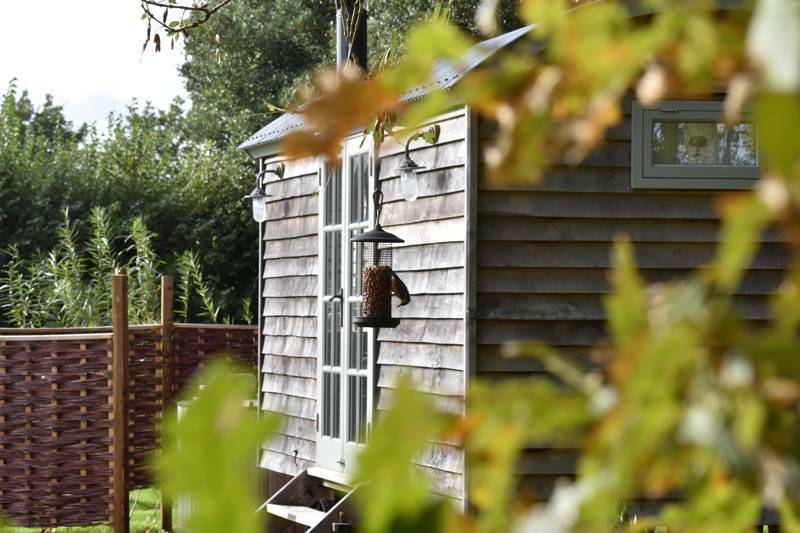 Our hut was lovingly and carefully built for us by Matt's brother, Jim, carpenter extraordinaire & perfectionist, who with some very clever design, in a space measuring just 7' by 15', managed to squeeze in somewhere for you to sleep, eat, cook and wash - amazing! Your comfort is very important to us! So you'll find a super comfy mattress, feather divers and pillows, cotton bedding, cushions, blankets and lots of fluffy towels. And the hut is packed with all sorts of useful bits and bobs that you might need to make your stay even better! Outside the wood-fired hot tub is perfect for an al fesco soak in the sun or under the stars! We are only to happy to help if there is something you would like us to organise for you beforehand or during your visit to make your time here even better! 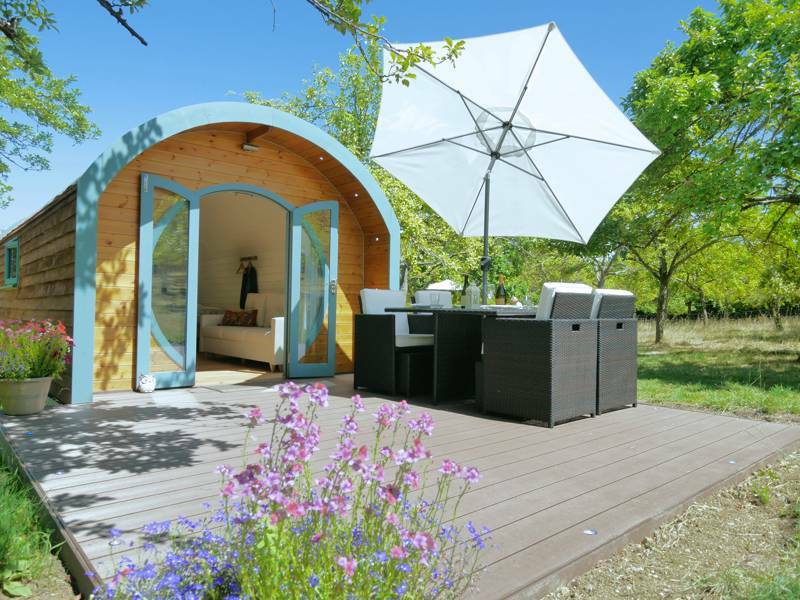 So whether you are spending time with your loved one or simply taking time out for a bit of R&R, we hope you will be able to enjoy a relaxing break and appreciate the comforts the hut has to offer. 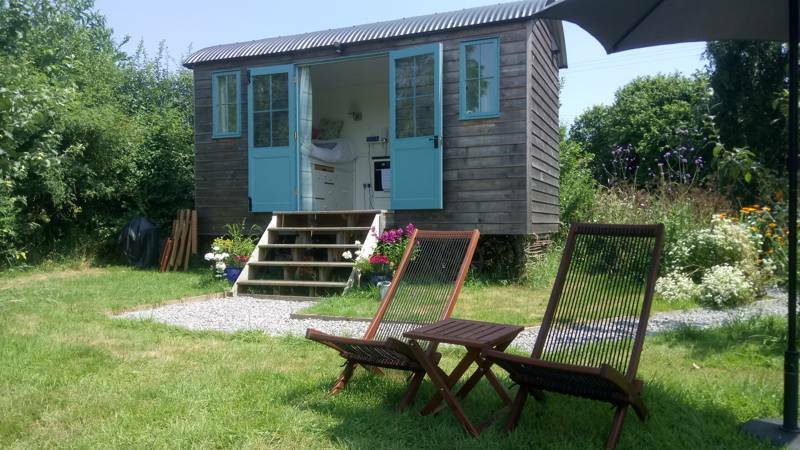 For latest availability and best prices for Stocklinch Shepherd’s Hut, please use the Date Search above. Shepherd's hut sleeps 2 in a raised double bed with neat storage underneath (bedding and linen provided; accessed using pull-out steps). En-suite bathroom has an electric shower, washhand basin, heated towel rail and flushing loo (towels and toiletries provided). Compact kitchen has a microwave oven, hob, fridge, sink and a selection of pots, pans, utensils and crockery along with essential breakfast supplies to get you through your first breakfast, including milk, bread, butter, eggs, jams, honey and marmalade, cereals, muesli, teas, coffee, hot chocolate as well as oils, salt and pepper. Fold out chairs, pull-out table, radio, board games, books and magazines. Heating inside. 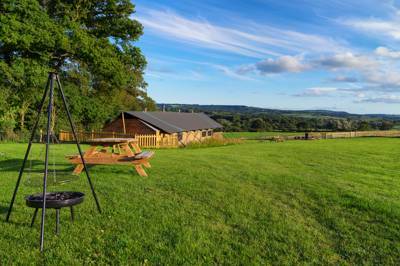 Outside, there is a wood-fired hot tub, tables and chairs, BBQ, fire pit, and a supply of logs and coals. Additional logs can be provided at £10 per wheelbarrow load. 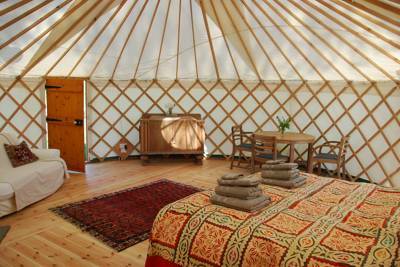 Guests have sole use of the orchard area, which is about a third of an acre. It’s 2 miles to National Trust-owned Barrington Court (01460 241938; adults £12; children £6; families £30), a Tudor manor house that took over a decade to build and was beautifully restored in the 1920s, with farm buildings, a vernacular stable court, abundant flowers and orchards – the place is classic Somerset. There’s a nice café there for lunch and it makes for an excellent walk from the shepherd’s hut. In the summer months, The Potting Shed at Denis Chinaworks (2 miles; 01460 240622) is another great walking option and has a delightful tea garden, too, where you can enjoy coffee, cakes and light lunches. Being on the edge of the Somerset Levels you can opt to pedal along the gentle flat lanes or alternatively take a slightly more strenuous route up the hills and down the valleys if you bring your bikes – Stocklinch Shepherd’s Hut is on the National Cycle Route Network 3 (the Stocklinch village website has several suggestions or you could grab the map and be adventurous). It’s a 40-minute drive to the coast – the likes of Lyme Regis, Charmouth and Axmouth are closest – while it’s 30 minutes to the Quantock Hills and 50 minutes to Exmoor National Park. Stocklinch Ales is a micro brewery 200 yards from the steps of the hut. It opens on Friday evenings and Sunday afternoons and offers its own selection of beer along with local cider from Wilkins and Lilley's Cider. Cider is also produced locally at Burrow Hill Cider (01460 240782) and Perry’s Cider (01460 55195), where you can sample and buy. There are two pubs within walking distance: It takes about 20 minutes to walk over the hill to The Barrington Boar (01460 259281), home to a good choice of beer and cider, excellent burgers and fish and chips as well as tasty puds (very comfortable sofas around the fire, too). The Duke of York (01460 240314), Shepton Beauchamp is also within walking distance, though a tad further. For most other things, Ilminster is the nearest market town and has ample independent food shops, including a cheese shop, deli, wine merchant, award winning butcher, bakery and the renowned Trading Post farm shop (01460 241666) at Lopenhead. For a light bite in town, No. 57 (01460 54856) is great for healthy options, The Meeting House (01460 55783) is fab for art fans in need of a quick coffee, while Feast (01460 53183) is great for vegetarians (Pip’s Railway Carriage – 07729 685412 – at The Trading Post is also a top veggie and vegan café, set in an old railway carriage). From the A303: Turn off at either South Petherton or Ilminster roundabouts and head for Whitelackington. There, turn near the big thatched house signed for Stocklinch. The road gets narrow and twisty as you enter the village with no road markings and some blind corners, so take care and drive slowly. Pass the village hall on the left. The Stocklinch Shepherds Hut is at The Old Post Office, Owl Street, the next house on the left after the old phone box. There is a gravel drive and wooden gates. 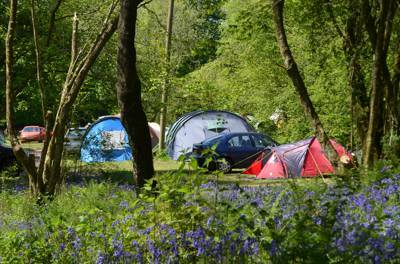 Please drive straight in and park up on the grassed parking area beyond the hedge which is solely for your use. The nearest train station is Crewkerne (Waterloo line) and Castle Cary or Taunton (Paddington line). You'll have to book a taxi from these though. There is a demand-responsive bus service called Slinky that runs all the way to the village. Contact Stocklinch Shepherds Hut for more details. By bike, you can cycle through Dillington House estate to get to Ilminster (2 miles) if you don't fancy the main road from Whitelackington. 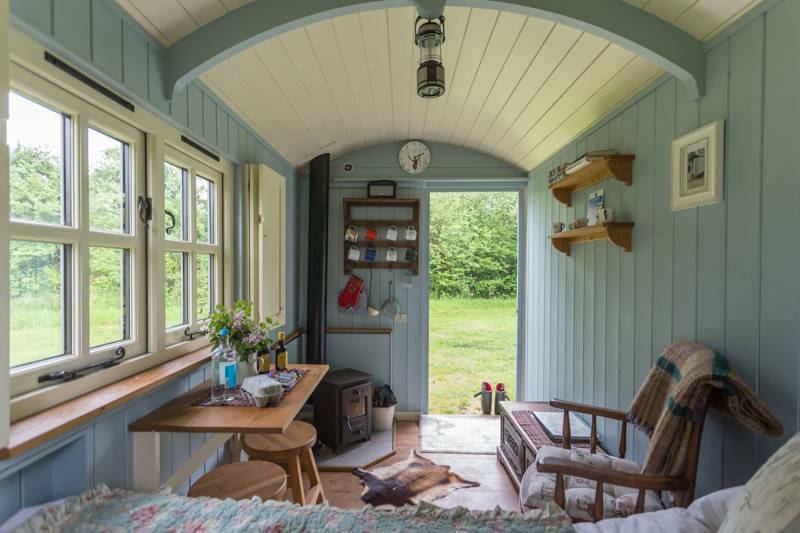 A single, luxury shepherd's hut (sleeping 2) set in a Somerset orchard.